Hurricanes, floods, fires — natural disasters and emergencies can happen with little to no warning, which is why it is important to have plans in place for your family and pets should you suddenly be faced with one. NO MATTER WHAT, NEVER LEAVE YOUR PETS BEHIND. Make sure that your cats and dogs are wearing collars with up-to-date identification tags. Make sure you put your cell phone number on your pet’s tag and, if possible, include a relative or friend that resides outside of your area, in case you have to evacuate. Microchip your pets: The chances of being reunited with a lost pet is greatly increased by having them microchipped. Please make sure the microchip registration is current with all of your contact information. Emergency Pet Kit: Have a kit ready to go for when a disaster strikes. For items to include, click here. Emergency Help List. Because everyone in the affected community will be in survival mode, you will want to have a list of helpful neighbors and/or emergency boarding facilities handy. Knowing where you’ll need to go to ensure your pet is safely cared for ahead of time will ensure your pet is safe for the duration of the emergency. Plan for a safe place to stay ahead of time. Before a disaster hits, contact your local emergency management office to find out what shelters allow pets should you have to evacuate. Never assume that you will be allowed to bring your pet to an emergency shelter. Hotels and Motels. Contact hotels and motels outside your immediate area to find out their pet policy and if there are any restrictions on breeds, size, number or species. For those that have a “no pet” policy, ask if this is waived in times of an emergency. Make a list of pet-friendly places and call for a reservation as soon as you think you might have to leave your home. Friends and relatives outside of area. Ask these people if they would could provide you and your pets with a safe place to stay, if need be. If you have more than one pet, you may need to arrange to house them at separate locations. Kennel or veterinarian’s office. Research boarding facilities and veterinary offices that might be able to shelter animals in disaster emergencies and keep the list handy. If you evacuate, take your pets. Rule number one: If it isn’t safe for you, it isn’t safe for them. You have no way of knowing how destructive the storm will be, how long you’ll be kept out of the area, and you may not be able—or allowed—to go back for your pets. Pets left behind in an emergency or disaster can easily be injured, lost or killed. Rule number two: Evacuate early. Don’t wait for a mandatory evacuation order. The sound of high winds, smell of smoke or just the change in atmosphere may cause your pet to become fearful and difficult to handle. And when evacuated by emergency officials, pets are oftentimes forced to be left behind. Evacuating before conditions become severe will keep everyone safer and make the process less stressful. 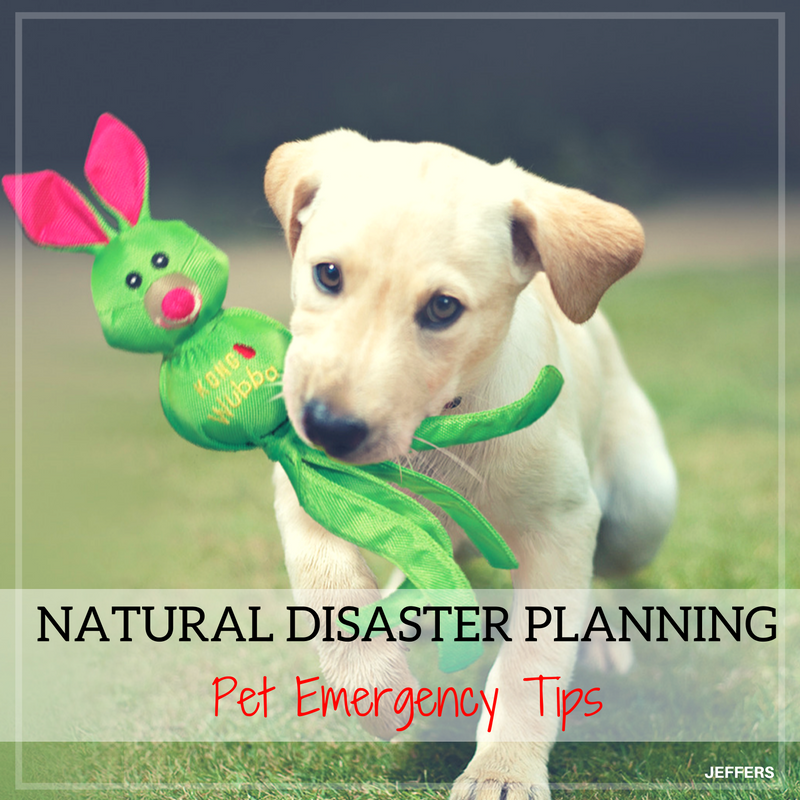 Make arrangements in advance: Have someone you trust to get your pets, in the event you’re not home during a disaster or evacuation order, and meet you at a specified location. Be sure the person is comfortable with your pets and your pets are familiar with them. Give your emergency caretaker a key to your home and show them where your pets are likely to be (especially if they hide when they’re nervous) and where your disaster supplies are kept. If you have a pet-sitter, discuss well in advance the possibility of them helping. If your family and pets must wait out a storm or other disaster at home, identify the safest area of your home where you can all stay together. Put your emergency supplies in that room in advance, including your pet’s crate and supplies. Remove any toxic products or dangerous items such as tools stored in the area. Bring your pets indoors as soon as notification is received that trouble is on the way or if weather is getting bad. If there are openings in the house, such as a fireplace, vent, pet door close them off with plastic sheeting and strong tape. Don’t come out until you know it’s safe. Your home may and surroundings may be a very different after the emergency is over and difficult for your pets to adjust to. Pets may become disoriented – familiar smells and landmarks might be gone. Don’t allow your pets to roam loose. Fences and gates may have been damaged. Watch your pets closely and keep them under your direct control. If your house sustained damage, keep dogs on leashes and cats in carriers to avoid your pets escaping. Be aware of hazards at nose, paw or hoof level. There may be debris, spilled chemicals, fertilizers and other substances dangerous to animals. Check for wildlife that may have sought refuge in your yard. Wildlife can pose a threat to you and your pet.